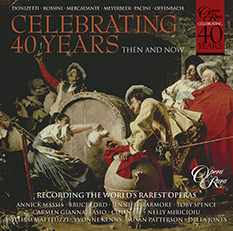 Featuring some of Opera Rara’s finest singers, this disc is dedicated to Sir Peter Moores and the Peter Moores Foundation in recognition of their invaluable support over the years. Featuring some of Opera Rara’s finest singers, this disc is dedicated to Sir Peter Moores and the Peter Moores Foundation in recognition of their invaluable support over the years. Since its foundation four decades ago, Opera Rara has enriched the lives of generations of opera lovers and has altered perceptions through its dedication to exploring and reviving rare works from the Italian bel canto period and from the middle decades of the 19th-century French tradition. By far the majority of Opera Rara recordings have been world premiere recordings. In many cases, Opera Rara will have rediscovered the work itself after decades (and, in some cases, over a century) of total neglect. 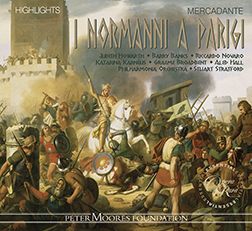 Reviving such works requires patient and expert musicological endeavour to ensure that all sources are collated and compared, so that the best possible edition can be assembled, rehearsed and recorded.This compilation features excerpts from the works of the most significant composers who are at the centre of Opera Rara’s output: Donizetti, Rossini, Mercadante, Meyerbeer, Pacini and Offenbach. 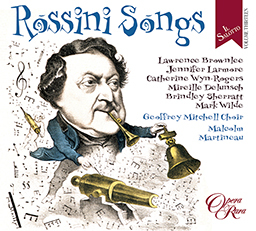 The excerpts are taken from the first Opera Rara recording by each composer and from the most recent. Opera Rara shines the spotlight on many of the stars who have recorded for the label over the years. The result is a fascinating and delightful survey of the richness that is Opera Rara. Featuring excerpts from: Donizetti’s Ugo conte di Parigi (1977) and Parisina (2008); Rossini’s Ricciardo e Zoraide (1990) and Ermione (2009); Meyerbeer’s Dinorah (1979) and Margherita d’Anjou (2002); Offenbach’s Robinson Crusoe (1980) and Vert-Vert (2008) and more. Annick Massis, Jennifer Larmore, Bruce Ford, Toby Spence, Colin Lee, Carmen Giannattasio, Nelly Miricioiu, William Matteuzzi, Yvonne Kenny, Susan Patterson, Della Jones.